Alton Glenn Miller was born on March 1, 1904, in Clarinda, a very small town tucked away in the southwest corner of Iowa. Having played around with a cornet and mandolin, the young Miller finally focused his attention on the trombone, when a butcher for whom he occasionally worked, gave him his first instrument. He continued to study and upon graduating from high school in 1921, he joined the Boyd Senter Orchestra for one year before taking up further studies at the University of Colorado. During this time, he penned numerous arrangements and in 1926 traveled to California with the Max Fisher Orchestra. Then came the major turn of his career when he joined jazz great Ben Pollack. In Miller's own words -- "The break of fortune that shaped my career? The interest that Ben Pollack showed in me when he hired me to play and arrange for his band." Certainly the Pollack outfit possessed a feel for big band authentic jazz and it was here that Miller met a man who was to become his lifelong friend and who would lend him the money to finance his marriage to his beloved Helen Burger. That man was Benny Goodman. Following further extensive tours, the Pollack outfit returned to New York City and in 1928 Miller joined Paul Ash's Pit Orchestra at the Paramount Theater. Throughout this time he would be a regular visitor to the recording studios, playing with both the Dorsey brothers and Red Nichols' Five Pennies. Thanks to Nichols, he would also work in two of George Gershwin's Broadway successes, "Girl Crazy" and "Strike Up The Band." On the latter show, Miller proved an invaluable help to drummer Gene Krupa, making signals to him to guide his playing; Krupa, only a beginner, was still quite incapable of reading the score sheets. When Jimmy and Tommy Dorsey decided in 1934 to form their own band, Miller--while continuing to study orchestration under Dr. Joseph Schillinger--organized an interesting line-up for them composed of one trumpet, three trombones, two tenors and an alto. In January, 1938, Miller at last realized his dream of leading his own orchestra, an outing that would last little more than one year. Undeterred, with the help of his wife Helen, he made a second attempt in March of 1939. The core of the new orchestra was formed by pianist Chummy McGregor, bassist Rolly Bundock, saxophonist Hal McIntyre and trumpeter Bob Price, all old friends of Miller's. 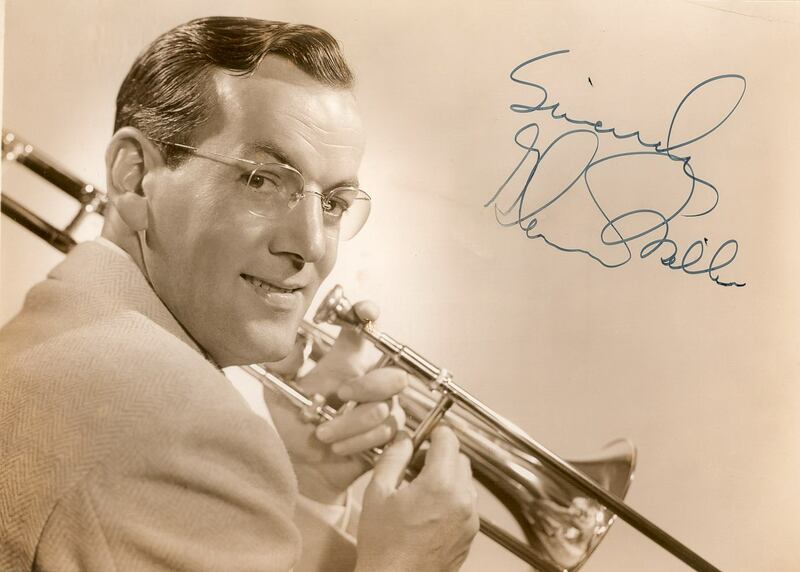 The band's early days proved difficult, but nothing would now prevent the rise of what would become the highest paid band in the world--the Glenn Miller Orchestra. "It's pretty much of an accepted fact that if you want to have a successful band, you've got to have something that's different," said Glenn Miller. "We're fortunate in that our style doesn't limit us to stereotyped intros, modulations, first choruses, endings or even trick rhythms. The fifth sax, playing clarinet most of the time, lets you know whose band you're listening to." This special Glenn Miller Reed Sound was first hit upon during Miller's stint with Ray Noble. Trumpeter Pee Wee Erwin was in the habit of playing an octave above the tenor, and when Erwin suddenly left, only Johnny Mince playing clarinet was available to replace him. Subsequently, this stylistic discovery would prove doubly fortunate during those early days of Miller's own orchestra. A true businessman with a taste for success, Miller ruled his men with an iron hand. Nobody was allowed to speak on stage. Everyone had to sport a handkerchief in his breast pocket, with socks to match. The smokers were requested to smoke Chesterfields during intermission of any radio shows sponsored by that brand. This strict attention to detail extended itself to the music itself. "We not only rehearse arrangements, we rehearse every bar a thousand times until he's satisfied, "a sideman once complained. Some musicians found the discipline too much and quickly moved on. But Miller also had his favorites, one being Gordon "Tex" Beneke, who, at Al Klink's expense, was allocated all the tenor solos. But even Beneke got the cold shoulder from Miller for several weeks for leaving his music behind at a recording session. Miller's philosophy was perfectly clear--"I don't want to be the king of swing or anything else. I'd rather have a reputation as one of the best all-around bands." Miller's contract with RCA's Bluebird label enabled him to cut more than 250 sides between Sept. 27, 1938, and July 16, 1942. Among them were such classics as "Chattanooga Choo-Choo," "The American Patrol," "String of Pearls," "Little Brown Jug," "Kalamazoo," "Tuxedo Junction," "Pennsylvania 6-5000" and "Moonlight Serenade." Almost from the day that America entered World War II, Miller knew what he wanted to do most was to create music for servicemen. He applied for a commission, received his captaincy, disbanded his civilian orchestra and reported for duty on Oct. 7, 1942. His first priority was to put together Army Post bands from experienced musicians. It had been his contention that soldiers would feel most like marching to music that inspired them. So with the aid of arranger Jerry Gray and chief drummer Ray McKinley, Miller inaugurated marching arrangements that swung. The cadets loved them and marched with increasing vigor to such swinging numbers as "St. Louis Blues March." In June of 1943, the big orchestra became a reality and it began a series of weekly, coast-to-coast radio broadcasts called "I Sustain the Wings," which featured the full 45-piece orchestra with singers like Tony Martin, Dinah Shore and Johnny Desmond. Finally, in July, the Glenn Miller Army Air Force Band shipped out to England to perform for our men overseas. The moment that entourage arrived in London, they were housed in a building right in the middle of buzzing, bursting bombs. Miller arranged to have the entire band moved the next morning to Bedford. The following afternoon a buzz bomb scored a direct hit demolishing the entire building. For the next five and a half months the band divided its time between BBC broadcasts and personal appearances before huge G.I. audiences. During the fall of 1944, plans were formulated to send the band on a tour of the continent and it was to be stationed in Paris. To take care of the band's quarters, Miller decided to set off beforehand from England in a C-64 Norseman plane on Dec. 15. That flight would disappear forever over the fog-shrouded English Channel. Major Glenn Miller would never be seen again. The band would continue to play during the war years under the leadership of band arranger Jerry Gray. "Glenn Miller was a very wonderful man who led a very wonderful band. As a civilian he led an orchestra that for three and a half years was the number one band in America. Now, Glenn could have stayed here. He could have stayed and made himself a lot of money. And then if he wanted to,he could have retired, an independently wealthy man. But he chose not to. He was an extremely patriotic man, and he felt an intense obligation to serve his country. So he disbanded his orchestra and formed an even greater one. He took himself and his orchestra overseas, to where he felt he could do the most good for our fighting men. And now this great band is back here with us this evening-- but without its most important member, Major Glenn Miller, himself. For, as we know, he made the supreme sacrifice for his country. But he will never be forgotten, for always we will have the sound of the great music he created." Universal Studios Press Release for "The Glenn Miller Story"